I chose those words carefully. 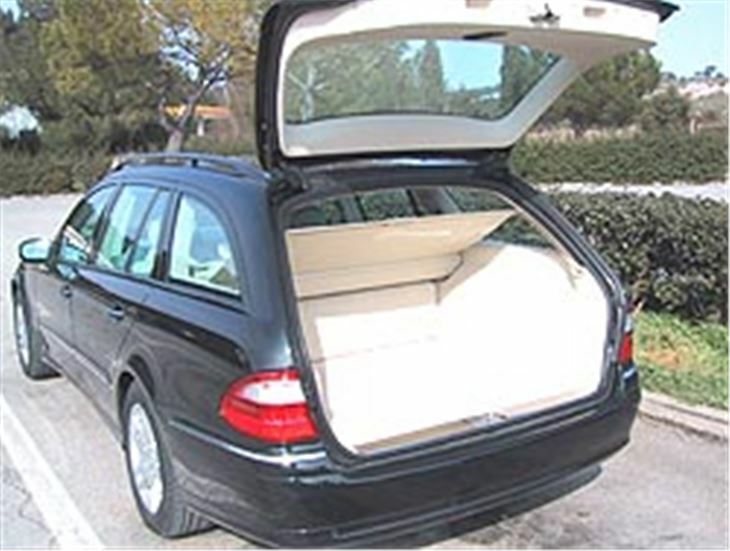 'Estate car' and 'station wagon' covers most bases. 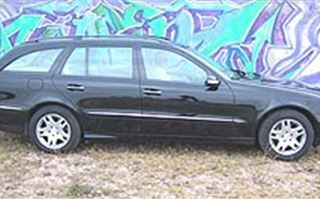 And, last year, no car impressed me as much as the new Mercedes W211 E Class. It could even have given the ‘Car of the Year’ title some meaning, but was beaten by politics. There have been a few developments in the line-up: an awesome 476bhp E55 AMG, and the truly staggering E400CDI V8, of which more in a bit. 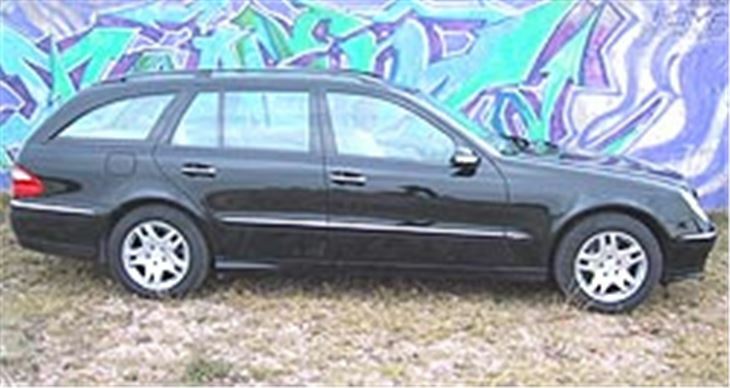 The purpose here is to introduce you to the new W211 E Class Estate. Not merely the best but also the safest estate car in the World. The B pillars between the front and rear doors aren’t just box sections. They are box sections inside box sections. And inside the double-skinned pillars are tubes of Boron alloy steel. The sills, too, are double-skinned, with strengthening pieces inside them, backed up by crossmembers under the seats. If something crashes into the side of a new E Class estate it’s going to have to do so very hard indeed to intrude into the cabin. And even if it does, the driver and passenger will be pushed across the car out of harm's way on their integrated seats surrounded by side head airbags and side curtain airbags. In a frontal impact, sacrificial crush boxes extending about a foot protect the engine compartment. Between them and the scuttle, massive box sections containing a triangulated tubular steel frame resist any further deformation. Even the sections behind the front wheels are massively reinforced to prevent the wheels being pushed back into the passenger compartment. And both driver and passenger are protected by intelligent dual-stage airbags, which inflate less violently for small impacts than for large ones. Whatever the crash test figures, this has to be the safest car to crash. 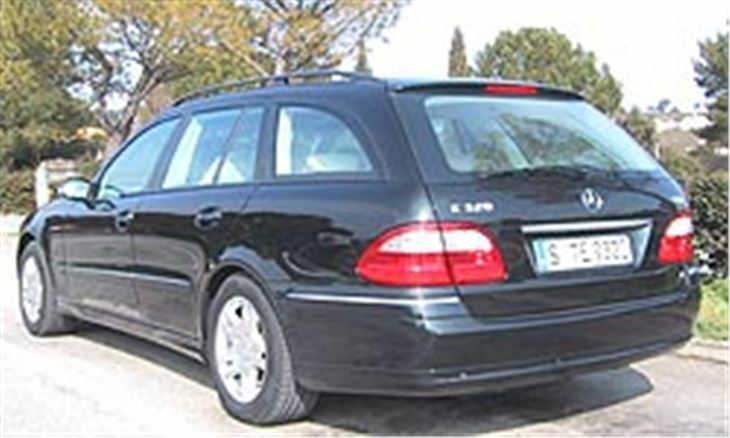 The first RHD release of W211 estates come with a choice of six engines: three petrol and three diesel (the way most will be bought). Lowest rung petrol is the new 1,796cc twin pulse supercharged 163bhp ‘200K’ four. Next is the 2,597cc 177bhp ‘240’ petrol V6. Highest, for the time being, is the 3,199cc 224bhp ‘320’ petrol V6. Despite giving away 800cc (the size of the whole engine in a Daewoo Matiz) the 200K is right on the 240’s back bumper. 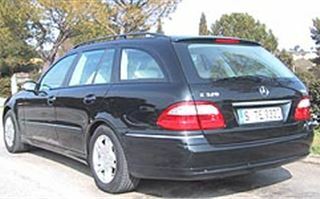 Gone are the annoyingly unpleasant harmonics of the old Mercedes four cylinder engines. This new 1.8 has balancer shafts to keep it smooth and enough power to make it characterful. With the 6-speed manual box that never felt right attached to the old four cylinder Mercs it’s a nice drive. As long as you choose your gears thoughtfully and don’t try carting too much of a load, it makes a very good case for itself. Particulary if most of the time you’re going to be driving solo when the considerable fuel economy benefit over the 240 V6 will be most felt. Next up, the 240 with the manual box feels a bit punchier, even though maximum torque is the same. It doesn’t matter as much if you find yourself in the wrong gear for the job and you can plop it into 6th much earlier. Obviously, if you go for the 5-speed auto, then the 240 is even more the obvious choice. But if I was buying and I had an extra few grand to play with I’d go straight for the faster, more economical E320 petrol. On second thoughts, though, I wouldn’t. 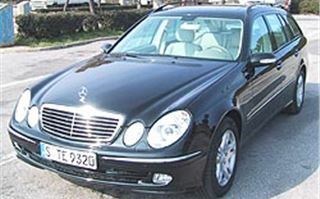 Instead I’d put my money into the E320CDI diesel, knowing full well I’d get it all back and more on resale, that I’d enjoy an extra 10mpg on average and that I’d get everywhere just as quickly. The diesels come as a 150bhp 220CDI, a 177bhp 270CDI and a 204bhp 320CDI which, until we get a 250bhp 400CDI V8 is probably the most desirable estate car currently available. We toyed with a word to describe the E320CDI, and “sublime” was the clear winner. The thing belts along at 100mph showing less than 3,000rpm on the tachometer and drinking diesel at just 7.3 litres per 100kms on average (over 38mpg). It’s completely comfortable. You can get it to change down yourself by nudging the lever to the left if you have some tricky terrain to contend with, or leave it to do the job for you, as most drivers will in the city, suburbs and motorway. Find a bend and it just clings on, especially with AIRMATIC DC suspension. In handling and performance you only lose out very slightly to the saloon and it’s such a small penalty that few drivers will notice. Even the 200K on standard suspension is really good with plenty of feedback to let you know just when either end of the car is reaching its limits. 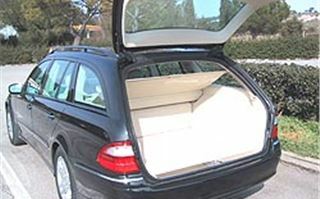 Round the back, obviously, you find the reason for the car’s existence: A truly cavernous compartment with a number of tricks of its own, which Mercedes collectively calls ‘EASY-PACK’. One is a back-saving electro-hydraulic slide-out load floor: something BMW thought about a few years ago. Alongside you can have a rail system, not unlike SAAB’s, which enables you to position straps, eyes or barriers to keep objects in place. 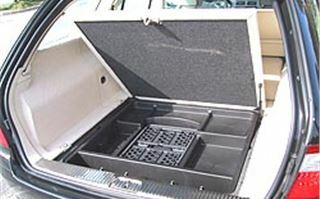 Between the load area and the rear seats you can fit long box, accessed by folding down the seats, a bit like the gun-safes in police patrol cars. 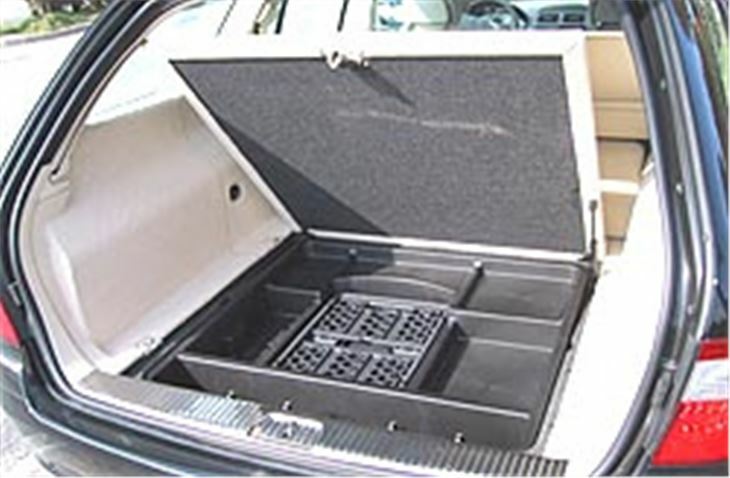 The luggage area floor lifts on gas struts to reveal a compartmentalised tray above the emergency wheel well, and a folding crate a bit like Citroen’s. Or you can go for the option of rear-facing child seats, but if you do you have to forego a full-sized emergency wheel in favour of a space saver or ‘Tyrefit’ emergency repair kit. For truck-like transportation, flop the rear squabs forward and you can lift them off to give a long, flat load area. You can even fold the front passenger seat back forward to offer a length of fully three meters: just a bit short of ten feet. As with the saloon, optional AIRMATIC DC suspension adapts the suspension to suit the way the car is being driven, or allows the driver to select ‘soft’ or two levels of sporty ride. On the estate, this is combined with standard Level Control System, ensuring rear spring travel remains constant whatever the load. Optional Dynamic Multicontour seats have a lumbar pulse to give you a an occasional massage at the base of your spine, which any osteopath will tell you is the best thing that could happen to it on a long journey. Then if you corner hard, the sides automatically wrap themselves around you to keep your body in place. These seats are both heated and ventilated with five small electric fans to make sure you don’t get sticky on hot days. Climate control is standard. But optional THERMOTRONIC allows each of four front and rear seat passengers to select and maintain their own individual climate zones. 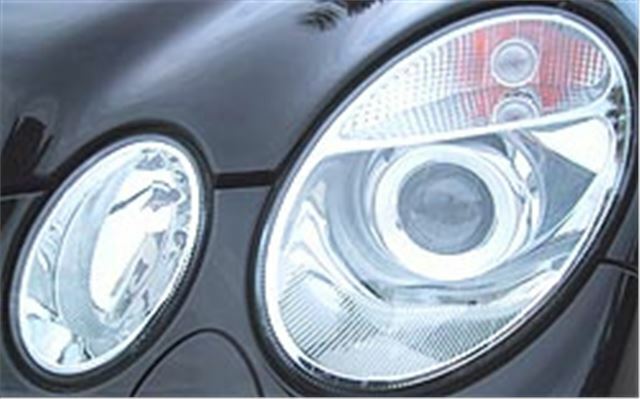 The ‘Active light system’ with bi-xenon headlamps, swivels the beams a bit like the old Citroen DS and XM system, helping the driver to see round corners when night driving on a twisty road. Headlamp bulbs now last the ‘life’ of the vehicle. Most importantly, while not intruding on driving pleasure, the combination of ABS with Brake Assist, Sensotronic Brake Control and Electronic Stability Programme make this car extremely difficult to crash. Two new addition, partially to compensate for the American style parking brakes are Anti-stall Assist which prevents the car rolling back when stopped in traffic on hills and Tailback Assist which stops the car on lifting off the accelerator, making it easier to drive in stop/start traffic. Mercedes Command APS control and display system is now even more advanced than previously. 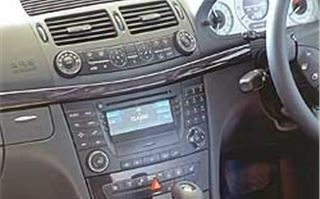 The cars come as standard with an Audio 20CD radio offering FM, MW, LW and SW reception plus a CD player. Audio 50 APS adds a dual FM tuner, CD player and cassette player as well as an integral navigation system with a 4.9” colour display. Command APS takes all this a stage further with a 6.5” TVT screen which can show DVD movies or TV broadcasts when combined with the optional TV tuner. Command APS has a second integral DVD player for the navigation disc. And, of course, all of this is packed into the stiffest, safest, strongest estate car body ever built. So there you have it. Whichever side of the Atlantic you live, its either the World’s best station wagon or the World's finest estate. Even better versions including a 4-Matic four wheel drive, a 500bhp E55 AMG and the 400CDI could come to the UK eventually. But from July the six engine, multiple trim range and huge list of options will be enough to keep 99% of buyers happy. If you want one, better get your name down right now. Finally, a word about the E400CDI saloon, which is LHD only and won’t be coming to the UK, but is a reason in itself to move to the other side of the Channel. The figures give you a taster of what you’re in for: 260bhp; 413lb ft torque; 0-60 in 6.6 seconds; and W211 handling. Fantastic. The unobtrusive ESP system even lets you get the back out ever so slightly to assist your progress. You simply cannot believe that this car is pulled along by a diesel engine and, once you’ve driven it, you may never want to go back to a petrol engine ever again.